The locking screw is an extended shank bolt with a slotted head. The locking screw male threaded end screws into the internal thread of the adjusting screw. The locking screw shank fits inside of the sleeve. The locking screw head tightens against a shoulder machined into the ring gage blank. The sleeve is a short tube that works as a spacer and locating dowel. The sleeve fits over the locking screw shank and between the adjusting screw inner face and a shoulder machined within the ring gage blank. The adjusting screw is threaded externally and internally and is split longitudinally. The adjusting screw male thread screws into an internal screw thread machined into the ring gage blank. The adjusting screw internal thread accepts the locking screw male thread. The body is the main part of the thread ring gage in which the thread ring gauge threads are located. The adjusting slots allow the thread ring gage body to flex as the thread ring gauge is sized. The adjusting slot terminal holes allow the thread ring gage body steel to be annealed near the major diameter to facilitate flexing as the thread ring gauge is adjusted. The locking slot functions similar to an adjusting slot during thread ring gage sizing, allowing the threads within the body to be opened or closed. To work with the locking screw assembly, remove the seal. If sealing wax has been used, it can be dug out or melted out. If hot glue has been used, it is easier to remove, but still needs to be pried out. After the sealing wax has been removed, unlock the locking assembly by turning the locking screw to the left, counterclockwise, a few turns. The adjustments to the thread ring gauge body are made by turning the adjusting screw. 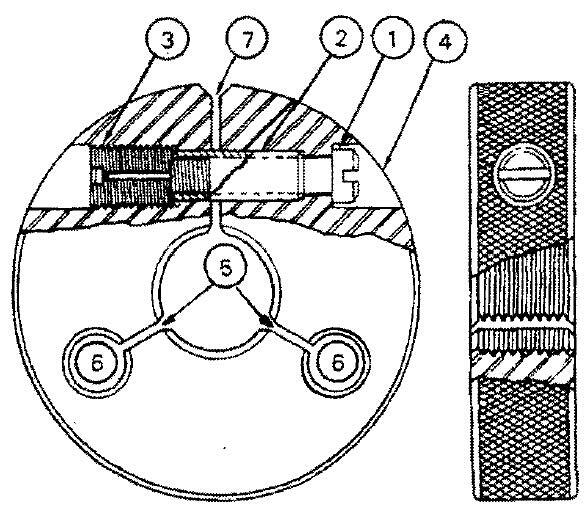 Turning the adjusting screw to the right, clockwise, exerts pressure through the sleeve against the shoulder inside the thread ring gage body assembly hole. The shoulder is visible on the left hand side of the thread ring gauge body as shown above. This pressure opens, or spreads, the thread ring gage body. Conversely, turning the adjusting screw to the left, counterclockwise, reduces the pressure through the sleeve against the shoulder inside the inside the thread ring gauge body assembly hole. The reduction of pressure allows the thread ring gage body to be closed, or constricted. This opening and closing of the thread ring gauge body allows the thread size to be adjusted. Once the thread ring gage has been properly adjusted against a truncated master thread setting plug gauge, the locking assembly needs to be activated. The locking assembly is activated by turning the locking screw to the right, clockwise. The tightening of the locking screw exerts a pull between the shoulder immediately under its head, and the internal threads of the adjusting screw. 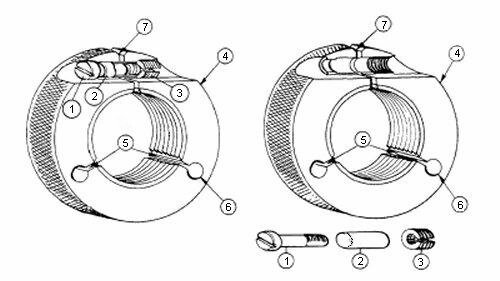 The locking action is accomplished by the locking screw forcing the adjusting screw to expand which forces the external threads into the threads in the wall of the thread ring gage body. The thrust of this action is absorbed up longitudinally by the sleeve. The clamping action is accomplished by expansion of the adjusting screw equally in all directions and not by the application of any eccentric forces that tend to distort the thread ring gauge or upset the adjustment. The locking pressure is taken up centrally in the locking screw itself as the reacting support is directly under the head of the locking screw in the form of the shoulder in the thread ring gage body. A properly fitted sleeve serves as a dowel to maintain the alignment of the thread ring gauge body. To avoid tampering with the completed adjustment, either sealing wax or hot glue needs to be used to cover and conceal the adjusting mechanism. Using Truncated Setting Plug Gages. This data is provided for general information only. The intention is to provide accurate information; regardless; errors may exist in the supplied information. If accuracy is critical, base your final decisions on the data provided in the root document: B47.1; which is a copyrighted document. To purchase a copy of an engineering document visit an Authorized Reseller.